The Queen arrives at the Abbey this morning. Absolutely no disrespect intended, but it is remarkable to see how the presence of the Queen transforms the mood. 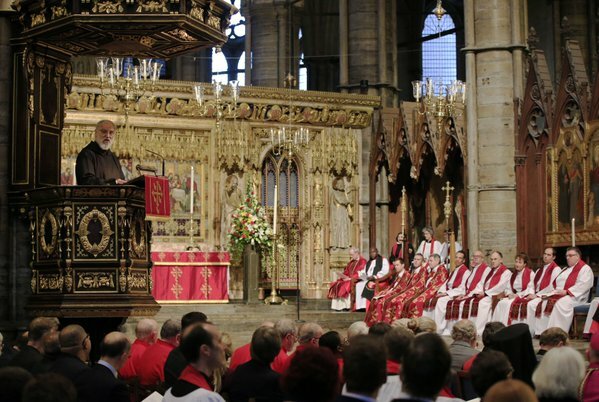 At Westminster Abbey this morning there was a lot of waiting about before the inaugural Synod service began, but once the fanfare sounded and the Queen arrived, everyone regained their energy. And again, back at Church House later on, when she gave a brief address to the whole Synod, the sense of appreciation and affection was tangible. I won’t dwell on the ceremony of the service. In my capacity as pro-Prolocutor of the Canterbury Convocation I had a front-row seat opposite the Royal couple, much to the annoyance of my fellow Bath and Wells colleagues, who were about six rows back. But apart from the fearsomely loud trumpeters (who offered royal fanfares), the rather lovely choir, and all the ‘dignified and stately’ worship that you would associate with the Abbey, the highlight of the worship was the homily. We must revert to being disciples of Jesus. That’s my very simplistic summary. Read the whole homily here. As ever in the Church of England, the history defines the present. In this case, the classic historical narrative is that the Queen, in succession with monarchs since Henry VIII (with one or two unfortunate interruptions) is the Supreme Head of the Church of England: As it says on our coins: Fid. Def. – Defender of the Faith. So it’s not unreasonable that she appears at a significant Church occasion like today. But there is a more contemporary narrative, which Archbishop Justin rehearsed in his welcome speech: that the Queen and Prince Philip have made it their business to be present at the inauguration of every General Synod since it was invented in 1970. The Queen addresses the General Synod. His speech was a very funny, but loyal, tour d’horizon of Church-Monarch relationships over the last five hundred years or so. You might well find it informative as well as entertaining – but sadly it doesn’t appear to be online. 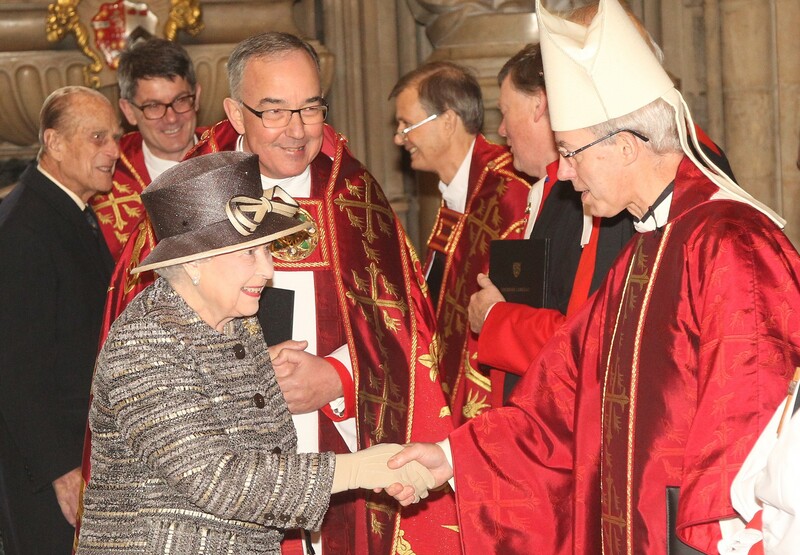 However (you read it first here yesterday…) the Queen’s address contained some very strong Christian themes, with a reminder that we are called by St Paul to be ambassadors for Christ, and much mention of prayer, notably for the suffering world. Read the Queen’s remarks here. The royal business took up the whole morning. We were given a long lunchbreak, and I was able to take my old friend Peter Spall and my godson James – who had been guests at the Abbey service – off for a (relatively) slap-up lunch before getting back into Synod business mode. First up was Archbishop Justin with a Presidential address with a unique visual aid – an ancient heavy lead plumb line which had been uncovered at Lambeth Palace during building works. Starting a new session, with (as I reported yesterday) half the members new to it all, he wanted to set the tone for what he hopes will be a reforming and different kind of Synod. So while acknowledging Synod has a legislative role that needs to be done properly, he also asked that before we get to finalising new Measures, Canons and programmes, we operate differently. We’re now at the point when various Synod posts are up for election. There has been much scurrying around with nomination papers (pretty well every elected post needs you to get a nominator and seconder if you wish to stand, and the deadline is tomorrow.) “This is when it gets political” said one old hand to me. I must declare an interest here, as I’m standing for Prolocutor (chair of the House of Clergy) for the Canterbury Convocation. There are no ‘party’ candidates, though obviously people have their own theological and personal background, which electors will bear in mind when voting. I had a lovely huddle in the tea-room with two other candidates as we discussed who might nominate/second each of us (it’s all pretty friendly, and Single Transferable Vote means you can feel confident that the electors will get the person most acceptable to most people.) But I won’t electioneer here. One was about whether DBS clearance applies to those who assist in distributing Communion, whether in church or in people’s homes. The Chaplains network has revealed some difference of approach around the dioceses on this. To my supplementary question, the Bishop of Durham gave a clear answer that there will be some guidance forthcoming so that all dioceses say the same thing. He also said that we would be requiring parishes to undertake ‘safe recruitment’ of those given permission to undertake this role. On clergy vesture, I tried to push the Bishop of Willesden to reveal what the House of Bishops had in mind about putting the ‘Hobbs motion’ (see this post for background) into Canon Law. The whole thing was first raised more than 20 years ago by my old mate Pete Hobson, but now the Hobbs motion is 18 months old, I though we should be told what’s happening and when. Bishop Pete revealed that a consultation exercise is likely, so that any proposed amendments to the Canons (which will be Article 7 business) will be those which would command wide support. This might be wise, as it means there is much greater likelihood of the proposals being guaranteed wide acceptance. Many evangelicals disregard the current Canon: some more traditional clergy regard changing it as a Bad Thing. I have spotted an interesting reflection on how matters get talked about at Synod. Fr Stephen Trott has put down a Private Members Motion (PMM) about marriage preliminary procedures – notably calling the banns in church. The background is that clergy are now required to do a lot more paperwork and checking before accepting a marriage ‘booking’ – and they run risks of breaking the law in matters related to immigration and citizenship even if they make an honest mistake. So removing all church preliminaries to marriage by handing them over to the civil registrar wouldn’t half simplify the clergy’s job. But it would remove a much-loved tradition – one which does offer an (increasingly less usable) pastoral opportunity. All this has been compressed by the media into “Church plans to scrap banns”. It became the lead line in a report in the Grauniad (to be fair, they did tack on the royal address and other aspects of today.) You need to get 100 members’ signatures for a PMM to be considered for debate. By teatime today, Fr Trott’s motion had about 10 signatures supporting it. However, a mention on BBC website has led to other media outlets making it a big deal. Which means that more Synod members now know about it than would otherwise do so if they merely read their Order Papers! It’s been an untypical day: tomorrow will feel slightly more normal, with a full business agenda, including legal stuff, evangelism reports and a major debate on how we handle our astonishing church buildings, which are both an opportunity and a burden, depending where you live and how you feel. Anyone who was in Synod today will realise that I have not reported on the RnR (Reform and Renewal – do keep up!) presentation this afternoon. That, dear reader is because I only followed it from the tearoom, where I was discussing electoral matters (see above). I’d rather say nothing than misreport it or make it up. bathwellschap has achieved a phenomenal following in the last three days. 366 views today (Tuesday). This is largely fired by Twitter Retweets (and kind comments) – you can follow @bathwellschap – and by good old Thinking Anglicans, whose listing brought in about 200 of them. So, appreciation to them: pay them a visit here. They give the bare bones and links to everything of note. 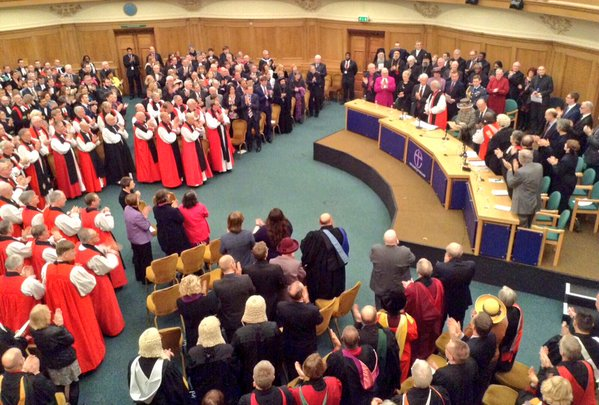 This entry was posted in 2015: Nov - London, General Synod and tagged Archbishop Welby, General Synod, Pete Hobson, women Bishops, Worship. Bookmark the permalink. Great blog as usual Stephen. I was following yesterday by live video feed so could see you doing your ‘stuff’. I did get to have some RnR and feel much better for it!